We review a number of our previous Waikiki Whisperer newsletters to see if anything is better, or worse, since we published the original stories (see them below). In no particular order. The conversion of 53,000 Oahu streetlights to energy efficient LED lamps is now more than half completed. The results are much as we expected. Nothing is better than we hoped. Most of the new lights are too bright and too white with little or no shielding to stop light intrusion to non-road properties. In Waikiki many of the residential streetlights have now been converted and the results are awful – dazzling bright lights on existing posts or suspended in the center by cables. The old goal of Waikiki’s Hawaiian Sense of Place with gentle indirect warm exterior lighting has been forever lost. Worst of all, the city has confirmed that NO environmental impact studies were carried outfor this massive project that has totally changed the nighttime environment on this island. Really? Studies are underway to see what impact these new bright lights are bringing to birds and other wildlife. Neighbor islands have enacted various controls on exterior lighting to reduce harm to migrating birds and marine mammals. In October 2016 we opined that the zoo should transform itself for a sustainable future in the face of serious funding deficits and loss of AZA accreditation. We said that large animals requiring massive costs for African style enclosures and water pools should be phased out. Such a small city zoo should focus on walk-in bird sanctuaries and endangered species breeding colonies. Today? Worse than we expected. $3.5 million spent on a 40,000-gallon pond for a single lonely hippopotamus. That’s what happens when a zoo is controlled by local politicians. Amazing! A rare major success. The beautiful Promenade has never looked better. It’s a joy to walk here away from traffic noise with calming views of the canal and canoe paddlers. Thanks to fixing the existing irrigation system the trees have flourished with new canopy cover providing total shade and more birds. Even the grassy areas are now green again. Bravo Parks & Rec! Those scary bad-boy “homeless” camps have been effectively banished forever and the graffiti-covered walls have been freshly painted over. The lighting remains warm and not too bright – lets hope the LED conversion contractors will not come in and ruin things. 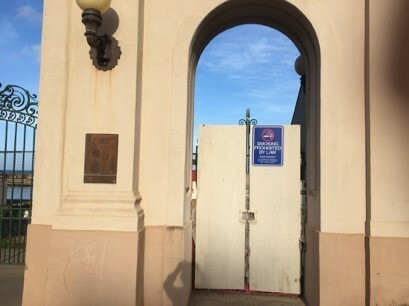 Managed by the Parks Dept, the Promenade is officially closed from 10pm. They were given $100,000 to provide upgrades such as bench dividers to prevent sleeping, many more benches, some picnic tables and secure vandal-proof trash bins. But so far nothing has yet been done. We dream of more “activation” for this glorious Promenade to encourage people to come here during the day and early evening. Such as coffee and snack carts, art fairs and perhaps occasional music performances. Discussions with the Convention Center, the main neighbor, have not yet taken place to see if they can bring more activity. But the Hokule’a will be here again April 19th! Any new ideas? Bad as ever after heavy rains. There was great hope that a donated Solar Powered Trash Wheel, like those used with success in Baltimore Harbor, would be installed here. Nope, nada. Idea was eventually dropped due to huge “permitting costs”. The old left side floating trash boom still collects some of the larger canal trash and city workers eventually empty it, but a lot of it continues to go right out to the ocean and beaches. Nothing done here. Still a disgrace. Even the opportunity to spruce up the frontage for the 100thAnniversary of the Armistice than ended WWI was lost, although a wonderful museum-style tent was installed here on November 11th. But hope lives eternal for the Natatorium. There are, once again, new plans for a major full restoration of this famous Waikiki landmark. The brightest news is that the Health Dept have agreed that swimming in flowing ocean water here would be permitted. They must have finally looked at all the thousands of ocean beach swimmers here each day. Hold your breath! The usual factions are still in place. "Save it all. Tear it down. Make it a beach, etc". Expect many years of fruitless wrangling ahead. In the meantime our sadness continues for this once beautiful monument. An unbelievable colonial-style military assault on our beautiful local environment. Six giant catchment area concrete “detention basins” (aka dams) requiring massive maintenance - by who? Called by many “Rail 2”. Get it? ​CAN ANYONE SAVE ALA MOANA BEACH PARK FROM HORRIBLE INDUSTRIALIZATION? Passionate activists plead with the Mayor to “Keep the People’s Park as It Is” - and they might succeed. But a massive 1-acre World Class Playground constructed in the middle might ruin it all. STREET NOISE TOTALLY OUT OF CONTROL AND RAPIDLY GETTING WORSE – CAN ANYTHING BE DONE? Muffler-modified motorcycles and cars create ear-shattering noise that can be heard a mile away. Boom cars with open windows play vulgar music so loud that even buildings shake. There are plenty of laws in place against these health-damaging sociopathic drivers – but zero enforcement. The city has finally announced when the conversion of all Waikiki streetlights to new energy-saving LEDs will take place. The work, starting in July 2018 and ending in October 2019, will be carried out by the monolithic Johnson Controls corporation. Their project website www.myoahustreetlight.com/ now provides much of the information we have been seeking for the past two years. will pay for itself. This is the good news and nobody disputes this. “The LED street lights in the residential areas will have flat glass lenses that will eliminate uplight and will have an internal reflector system to focus the light on the roadway. This will also greatly reduce the impact to migratory seabirds. These street lights with 3000K color temperature have also been approved by the International Dark-Sky Association (IDA). The LED street light fixtures along North King Street in Kalihi and in Chinatown will have globe-type lenses to match the style of the existing fixtures. There will be some uplight from these fixtures due to the physics of light transmittance through the lenses. The effects of the LED street lights on human health will be negligible because the light will be directed on the roadways with very little trespass onto private property. Furthermore, we are using the 3000K color temperature LEDs, which have less blue content than the 4000K LEDs and are recommended by the American Medical Association (AMA). For a glimpse of Waikiki’s future new LED street lights you can already take a look at Ala Moana Boulevard where the conversion was completed last year. These powerful ultra-white lamps are not so well shielded and the light they cast far and wide is rather ghostly. Traffic engineers will praise them but residents will lament the loss of the warm light from the previous sodium lamps. Johnson says all of their new LED lamps will be capable of individual central control, hopefully allowing dimming as needed. We praise the City and Johnson Controls for finally responding to the concerns of many about the massive project to convert all of the island’s street light to LED technology. By later next year we will be able to see what our new nights look like. "Working together with a broad coalition of partner organizations we believe that residents and businesses in Waikiki can actively participate in this effort to ensure that the future will continue to provide a beautiful tree-filled urban environment that attracts visitors and allows everyone to enjoy living in our world-class Paradise. 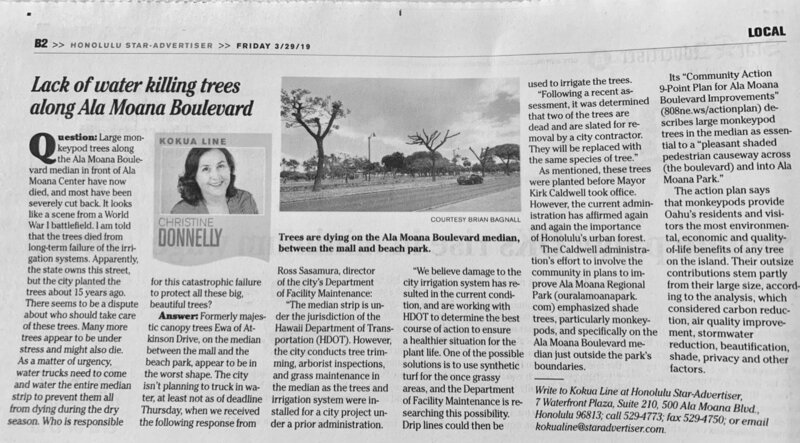 In addition to trees we intend to explore some other issues of livability that Waikiki residents are most concerned about, including street noise, nighttime light pollution and the proliferation of commercial signs that violate the state’s strict signage laws that make our islands uniquely beautiful and peaceful." 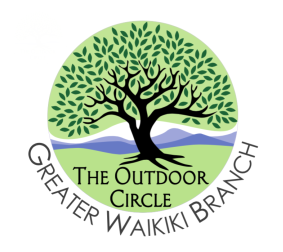 I recommend you take a look at our very comprehensive branch website: Waikikioutdoorcircle.org. You will find a huge amount of information that I am sure you will find of interest. What next for our Branch? We recognize that our urban members are unlikely to have the gardening resources that other branches have at their disposal. No rakes, brooms and shovels etc. We continue to look for ways to be a "Think Tank" to promote ideas that honor the 100-year legacy of The Outdoor Circle - our State's most respected community environment organization. We plan to develop our new Trees & Livability Committee as a long-term coalition group to explore ways to halt the continued loss of our heritage trees and how to plant many more. If you would like to be involved please reply to brian@outdoorcircle.org. We'd love to have your help. With just 25 signed-up members we need more to join us and walk outdoors with us. We hope to have a first public meeting of our Branch sometime in the coming months with a few expert speakers. Written by: Ireland Derby, Outdoor Circle State Office Intern. Saving the planet and all its wonderful creatures seems to be all anyone can talk about nowadays, and yet few realize that a serious predator is right outside their window, probably lighting up their porch. This predator is commonly known as “LED”, which stands for Light Emitting Diode. They are popularly known because they’re energy efficient, but that doesn’t make up for all the damage being caused. Their extreme brightness in the night is disrupting plants’ and animals’ regular schedules, and this is extremely harmful to the species that are already endangered. One species of animal that has been endangered for quite some time now and is feeling the full effect of LED lights, is the sea turtle. The process for a female turtle to lay just one egg is extremely difficult having to already deal with natural born predators, but add LED lights to the mix and it’s almost near impossible. Beaches are now lined with hotels, tourists, and streetlights which are so overpowering it’s disrupting the hatching process. If a mother turtle has multiple failed attempts at laying her eggs on shore, then she will drop her eggs in the ocean or at extremely dangerous nesting spots. Either way, the chance of survival for her babies is extremely slim. If the little hatchlings do make it to this world after hatching, there are still so many dangers that await them. Besides dodging birds and dangerous predators, LED lights make them extremely confused about their surroundings and can cause them to travel inward instead of towards the sea. Because of this, they have a 99% chance of dying due to being killed by predators, being extremely dehydrated, or by starving. According to scientists, the reason they wander towards light is because they have an instinct to go towards the moonlight reflecting off of the ocean. These beautiful and graceful creatures have been endangered for quite some time and their numbers are only going to keep dwindling if something doesn’t change. Luckily, there are solutions well within our reach. All we have to do is turn off the lights. That is the easiest solution, but there are other solutions as well, such as using LPS (low-pressure sodium) lights, closing your curtains after dark, or using light shields on streetlights near the beach. If this is done, then these endangered beauties can live to see another day. LED lights are commonly known to grow smaller plants indoors using a less harming level on the light spectrum to produce the same effect as the sun. But for those bright, ultraviolet, harmful LED lights that are on the streets, they are destructive to trees who are extremely sensitive and responsive to day light. Because of this, it can cause continued growth extremely close to winter that is far too dangerous for the trees. In order to protect themselves during winter, they need to shed their leaves off to be able to develop a protective covering to survive the winter. If their leaves are still on too late, ice and snow can pile on top and break branches and do some serious long term damage to the trees. Young trees are more likely to fall victim to this issue than older ones because they have a much higher growth rate and are extremely vulnerable to LED’s. If tree foliage, young or old, is exposed to continuous lighting over a respectable amount of time, it can cause them to grow larger than their natural size. This light causes their stomatal pores to remain open longer, in which will make them more susceptible to water stress and air pollution. This is an absolutely devastating problem occurring worldwide, but there are simple solutions to fix this. All that needs to be done is switching the bulbs of the LED lights that are on the high red and infrared spectrum to high or low blue, or low red. (These solutions are extremely easy to accomplish with a little hard work, passion, and determination, all we need to do is act now and not wait for someone else to take care of the problem before it’s too late. These infrared predators in the night will only continue to harm and kill animals and plants if something isn’t done, and these are only just a couple of examples. There are many more creatures and plants threatened by LED’s all over the planet. The Earth is meant to be dark at night for a reason, so these certain species can reproduce and thrive in the night, but instead the complete opposite is happening, thanks to humans. There are solutions that we are very well capable of doing, the only thing we have to do is act upon the problem at hand. Department of Physics Florida Atlantic University. "Light Pollution Harms Plants in the Environment". Accessed on November 7, 2016. Hawksbill Sea Turtle. "Habitat Loss and Degradation". Accessed on November 6, 2016. Sea Turtle Conservancy. "Information About Sea Turtles: Threats from Artificial Light". Accessed on November 7, 2016. William R. Chaney. Purdue University, Department of Forestry and Natural Resources. "Does Night Lighting Harm Trees?" Accessed on November 7, 2016. ​Meet Art, who lives in a condo tower at 1600 Ala Moana Boulevard. He can often be seen tending some garden beds where the path to Ala Wai Promenade joins the busy main street. 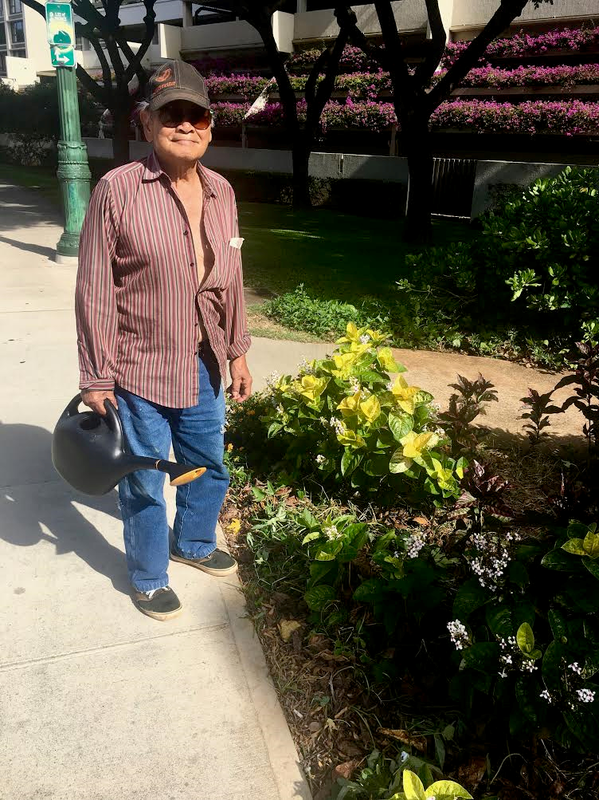 Thanks to his care of a mix of edible and decorative plants with watering, weeding and pruning, as well as frequent litter cleanup, this unexpected patch of green beauty greets the many hundreds of people who pass by each day walking to and from the Ala Moana Center. We salute his volunteering pride. 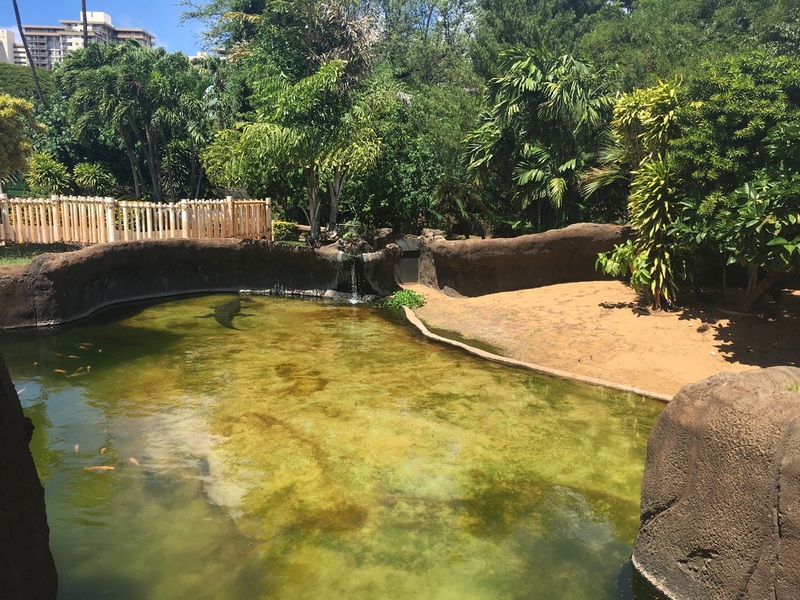 Our zoo is a beautiful treasure - right in the heart of Waikiki. Its 42 acres contain some our most gorgeous heritage trees, shrubs, parkland and, of course, some wonderful animal and bird collections too. But this little urban zoo is now simply unsustainable. It has lost its AZA accreditation because it has unreliable funding and is unable to provide adequate costly housing for its largest wild animals. Times move on and, like circuses can no longer use elephants for public entertainment here, small city zoos like ours can no longer continue to display large African wild animals in restrictive cages and concrete moated enclosures. There are many reasons - it’s regarded as inhumane and dangerous today and unnecessary to show these sad imprisoned creatures to children who can learn much more about them from modern videos and online learning centers. Only large well-funded zoos can continue to house large animals under acceptable ethical conditions. 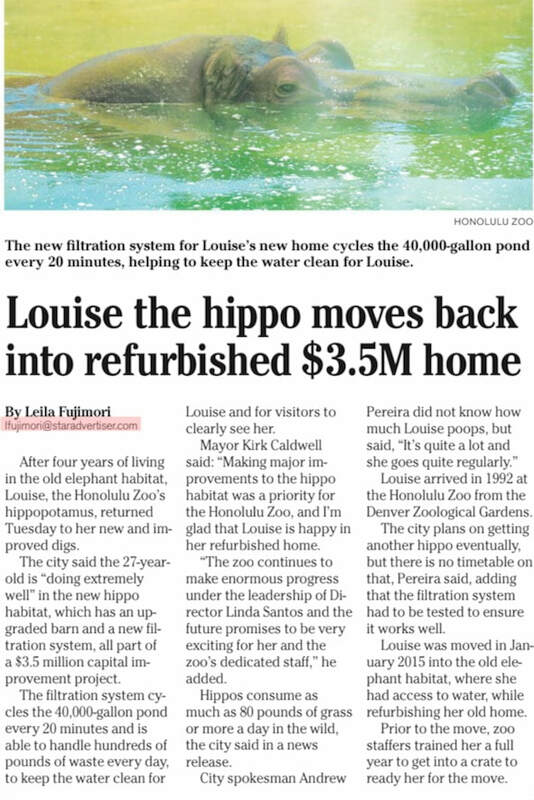 In addition, it’s impossibly expensive - the majority of Honolulu Zoo’s expenses are caused by large-animal staffing costs and the huge water and sewer bills associated with their pools, moats and animal waste disposal. Then there is the Elephant in the Room - City Politics. No zoo can sustain the endless cycle of elections, tax battles and revolving door leadership associated with such overt political control. Every year absurd ideas emanate from politicians, such as the latest one to cut down our precious heritage monkeypod trees in the zoo parking area and build a multi-story garage. This year voters are being asked to vote on more taxes for the zoo under Charter Amendment 9. It’s time to vote No and to push instead for Transformation of the Honolulu Zoo. This is not a new concept and as a result, many zoos around the world are now transforming themselves to be more responsible and sustainable. We suggest that the process start right away. Make a list of all the animals that we should no longer keep here. This includes elephants, giraffes, chimpanzees, rhinos, alligators, zebras, lions, cheetahs, African wild dogs, warthogs and some others too. Make a plan to slowly move them out and relocate them to more appropriate large zoos and sanctuaries. It’s time to get over the fantasy that we must have all these animals here to show our keiki. It’s Game Over. We explained circuses, now this. What to do with the vacated animal enclosures? Expand what we can do best. More low cost walk-in bird sanctuaries and breeding colonies. More of the cool and peaceful mini-parks and arboretums that are so delightful for families to enjoy now. Costs will be dramatically lower and AZA accreditation will surely be regained. We can be one of the best small zoos, not the discredited worst. A reminder, the zoo’s 42 acres are not located on city land. It’s a part of the 100 year old Kapi’olani Public Park that was allocated to the zoo in 1948. The city provides the park’s mythical “trustees”. Any attempt to commercialize or change Kapi’olani Park will be fiercely contested in the courts. In the meantime, the zoo’s staff work incredibly hard to keep our zoo in such excellent condition. They deserve our highest praise. Time to let them spread their wings with a truly transformed Hawaiian treasure zoo. Go and visit to see families enjoy it before it is burdened with more with shackles. Honolulu Zoo’s mini-parks and trees are world-class. No need for visitors to travel out of town to the Foster Botanical Garden to admire them. And it’s surprisingly cool here on a hot day. A lone elephant imprisoned behind an electric fence? Really? Waikiki is experiencing its worst environmental & public health crisis in generations. 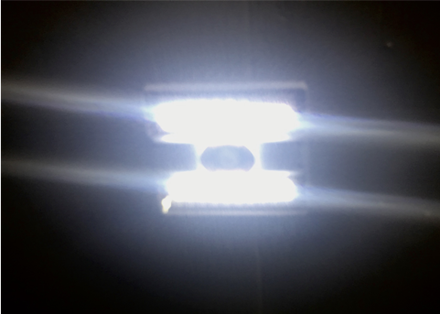 With no safety data, no environmental impact assessments and no enforcement of weak city lighting regulations, the light-emitting-diode (LED) lighting industry is having a bonanza selling its energy-efficient, ultra-bright, ultra-white and ultra-powerful lamps not only to Waikiki but to the entire island of Oahu. Waikiki is rapidly being floodlit by thousands of these unwatchable glaring white lights in shops, streets and condo garages. It is not just light pollution any more - it’s light abuse. The worst is yet to come. The days of romantic warm “Hawaiian Sense of Place” tiki-torch-lit evenings are coming to an end as LED lights are now being placed everywhere, including right above the tiki-torch flames themselves. Soon Waikiki will look like AnyTown ShoppingMallUSA with the “visual blight” of over-lit shops and floodlit buildings. Our hard-fought state-wide ban on billboards and ugly outdoor advertising now finds over-illumination is the newest form of promotion. And the City & County have announced that next year they will spend $50 million to convert 50,000 yellow sodium streetlights to new LED lamps island-wide. They say that the lights will be a warmer color temperature and will be better shielded to direct light down but no public demonstration of these new lights has been made available. Take a short drive up Likelike Highway at night to see the miles of new LED lights that cast a ghostly bright white radiation across the road. Despite some shielding around the lamps, when you get within a few hundred yards of them you will experience an uncomfortable dazzle from the star-like luminaries above. Sorry if you are a bit older and your eyes show big starbursts around ultra-bright lights. Remember the national complaints about oncoming high-intensity car headlights several years ago? LED “luminaires” are arrays of diodes. Without diffuser lenses the light is painful to look at. Try this quick test: Look up directly at a bare LED light array and watch it for five seconds (if you can!) Then look away and blink several times - you will surely see “retinal afterburn” images of the lights in front of you that will take 10-20 minutes to fade away. It’s unlikely that any permanent damage has been done to your eyesight unless, of course, you have not uncommon age-related macular degeneration in which case you might well be making things worse. Nobody knows what years of looking at these LED lights will do to your eyesight but studies in rats suggest that the retina is damaged and will not repair itself. Safety Commission has so far avoided the subject. In the meantime it’s not a bad idea to wear sunglasses at night in over-illuminated Waikiki. The Windsor condo in Hobron Lane is one of the worst examples of excessive and abusive LED over-illumination of its garage levels & front entrances - “like a prison yard”. Next - walk through the Hilton Hawaiian Village Resort complex. LED lights are already installed on their entrance trees and on top of their main tower a massive LED floodlight blazes cold light over their swimming pool and terraces. Feel like a stargazing walk on Fort DeRussy Beach? Forget it - the entire length of the popular beachfront path is now over-lit with huge LED luminaire poles that floodlight the entire beach and waves in harsh white light. Poor marine creatures such as our honu must be more than disturbed by their new sci-fi nocturnal ocean environment. Now head further to Lewers Street shopping zone with its neat artificial grass, palm trees and fancy shops flanking the packed Yard House pub. Those cute flaming crossed Polynesian Tiki-Torches are still blazing away to convince the tourists that they are in a warm glowing Paradise. Oh, but now there are super-bright LED lights everywhere that kill the torchlights and make the whole street look like any US shopping mall. Midnight in rain - the Ala Moana Center’s top garage deck is the worst of Light Abuse. What to do? 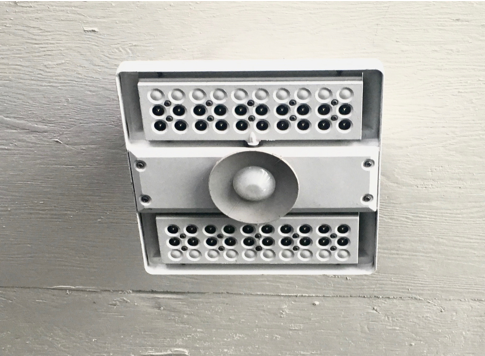 Tell the City to enforce its existing Waikiki Special District Guidelines on outdoor lighting that specify it should be “subdued or shielded as to prevent glare and light spillage”. And tell them to adopt dark-sky friendly regulations like those of the Big Island that keep their towns looking Hawaiian at night. Insist that LED lamps here be no whiter than 3000K warm color temperature. Not only does warm lighting make us feel happier, it does not harm our eyesight like ultra-white light containing excessive blue spectrum. If you doubt that anyone can really fight City Hall, try creating your own Personal Boycott List of shops, restaurants, bars and condos that you think are violating your Personal Right To Darkness. You will feel better to follow your own moral compass on the LED lighting wars that are just beginning. Perhaps start with the DFS Galleria shops whose dazzling over-lit front windows effectively floodlight all of Kalakaua Avenue. And maybe add the new International Marketplace with LED floodlights on all its street front palm trees. Finally, walk up to the new Longs Drugs building that is brightly lit with a ghastly wall of LED lights. There are many other shops that are disturbing us by gross over-illumination. Lewers Street shopping precinct. Note LED lamp posts not yet switched on. Light Pollution in Waikiki, Part 3: LED lighting’s adverse impact on nature. After six years of planning and $1 million + of construction costs, the long-awaited Hawaii Law Enforcement Memorial opened in May in the vast grounds behind Honolulu Hale (City Hall). It honors all our heroes who have fallen in the line of duty in Hawaiian police, National Park rangers, US Coast Guard and Military Police services. It is also a ceremonial stage for solemn official services with two flagpoles illuminated by blue floodlights at night. Here you’ll find the 65 names of law enforcement officers who paid the ultimate price over many decades. For more information visit the Memorial Foundation. ​Set away from nearby traffic, the site is located in the grassy Civic Center grounds which contain some of the city’s finest old Heritage and Exceptional trees. As soon as it opened, however, the memorial was defaced by bike riders who left tire marks all over the bare cement walls. Some plantings in the surrounding beds have been completed but it will take some time for them to grow. With no shade, the all-concrete surfaces heat up to 115 degrees in the sunlight - not a place to leave any floral tributes or sit on a chair in a daytime ceremony. Some suggestions to help make this stark memorial a more beautiful place to honor our fallen officers? Put about 20-30 large planters at various locations to stop bikers and skateboarders from using it. Quite large trees and shrubs can be grown in these to provide much-needed shade and privacy. And plant many more new trees surrounding it - only one small one completed so far. 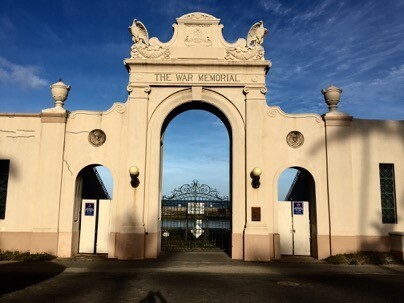 Each day visitors from our World War One Allied Countries walk through Kapi’olani Park to find our War Memorial - to pay their respects in memory of the Great War, The War To End All Wars, Lest We Forget etc. And our Pacific neighbors, Australia and New Zealand, lost enormous numbers of their servicemen in terrible battles. In all Allied countries, even in the smallest towns, such a war memorial would be immaculately maintained, with surrounding gardens and an atmosphere of peace and reflection. It would be unthinkable to allow such a memorial to be neglected, especially now that the 100 year war remembrances have begun. 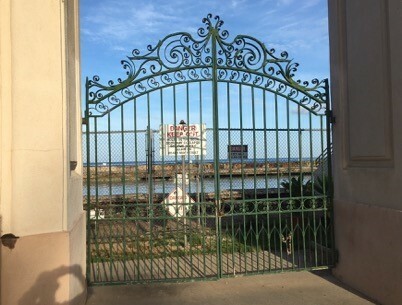 The squalor starts at the gates, rusted, unpainted and secured with a rusty padlock. Beyond them lies a ghostly chainlink fence with several Danger Keep Out signs attached. Through here you will see the rusted, rotting concrete carcase of the once beloved Ocean Swimming Pool, slowly sinking below the waves, unrepaired since 1950. The two side arches are secured with the ugliest deteriorated plywood and on each is posted a severe Smoking Prohibited By Law sign. Really? Rust is streaming from the light fixtures and the repaired cracks in the plaster have not been painted so they look like scars. But Lo! There is a bronze plaque affixed below the right side light. Let’s see who is remembered here. 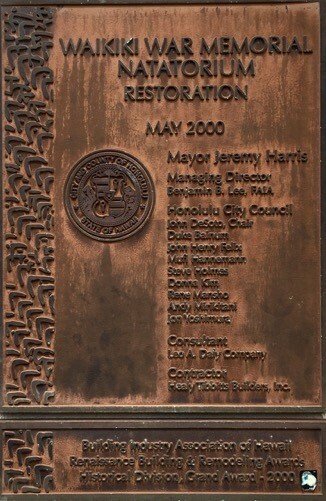 Oh, it’s the City Councillors honoring their own members and the building industry that got the remodeling contract in the year 2000. Are you kidding? How nice of the City to allow Ocean Safety to park all their pickups, jet skis and other equipment here. The parking lot in front of the memorial is depressing, dusty and neglected. No gardens grace the entrance and the park area here is just a sandy dirt track. Some yards inside the park you will find the war Memorial Stone with a plaque containing the names of a few of the US and British war casualties. No garden surrounds it. The City is now receiving comments on their latest State Historic Preservation Determination (“SHIPD”) plans for the Natatorium . Don’t expect any agreement among the various interested parties. Rebuild the entire pool, demolish it all, keep the bleachers, move the memorial arch back, build ocean groins and make a new beach etc. It’s a good time to visit natatorium.org and learn all about this ill-fated War Memorial. Let your council members know what you think. Hey, how about telling them, or just yell at them, before you waste hundreds of thousands of our tax dollars on consultants once again, at least spend just a few thou to fix and clean up the entrance so that we cease insulting our Allied visitors so very deeply. Not to say how our own residents also feel so disrespected. The newly constructed Ritz Carlton lit up at night. ​Before the onset of massive urban centers and the lights that illuminate them, individuals used to be able to look up at the night sky and see numerous stars and even the Milky Way. Now, such events are rare to see and some never get to experience such a deep connection with nature and the cosmos. While this is a tragedy in itself, new research is beginning to show that light pollution not only wastes vast amounts of energy, but is also a threat to our health and that of plant and animal species. These detrimental effects are being noticed by the public who are beginning to speak out against light pollution and the new visual blight that it represents. Luckily, while these negative impacts are great, they can be reversed and prevented with the ultimate goal of a healthier future for both humans, the global environment and the night sky for years to come. According to darksky.org, light pollution is described as “the inappropriate or excessive use of artificial light” that is a side effect of such manmade sources as “the interior and exterior of buildings, advertising, commercial properties, offices, factories, streetlights and sporting venues”. These point sources of light pollution are a major problem due to: their illumination levels being far brighter than is required, poor light fixture shielding or just being unnecessary to begin with. The negative effects of these light pollution sources include: increased energy consumption, disruption of wildlife biological patterns (especially for nocturnal animals) and harming human health. The link between human health and light pollution comes in the form of reduced melatonin production which affects our circadian rhythm, and inhibits everything from our ability to sleep better, to being able to impede cancer cell growth. ​The recent changeover to new inexpensive, ultra-bright and energy-saving LED light fixtures in Waikiki creating light pollution has caught the attention of the general public resulting in vocal opposition and a search for solutions. ​One such example comes from the extremely bright stairwells of the Ritz Carlton Tower on Kuhio Street now causing neighbors to shut their windows and blinds at night. Another comes from the panel-like illuminated walls of the Symphony condominium on Ward Avenue which stays on during all hours of the night, disturbing nearby residents. On top of this, many garages have begun to install new LED lights that spill ultra-bright light from their wide-open levels. In answer to these and future threats to Waikiki’s night sky, a new set of Waikiki Special District Design Guidelines for new construction have begun to be drafted which for the first time directly mention the issue of light pollution. These guidelines state that “use of dark sky friendly lighting is recommended for site and security lighting” and “uplighting should not be used to illuminate large expanses of buildings or entire facades”. These guidelines begin to clearly identify the issue of light pollution in Waikiki and how it can be properly controlled over time. The public debate has thus begun. Unlike other types of pollution, light pollution is easily reversible. Solutions include: light shielding so the only area illuminated is the one that is intended to be, as well as installation of dimmable lights and timers that turn lights off at a certain time. It is hoped that existing building owners and managers might be persuaded to correct disturbing “light trespass” from their light fixtures. By implementing these solutions over time, we could begin to see a renaissance of Waikiki’s beautiful night sky and the benefits it provides for us all. ​Pollution in the Pacific Ocean is a very serious threat to all marine life. One of the worst types of pollution is seen in the form of plastics, which enters into our lovely blue oasis. In the North Pacific “garbage patch”, which is one of the largest collections of trash in the Pacific Ocean, there is thought to be over 100 million tons of plastic and debris floating around in this swirling vortex formed by natural ocean currents. As a result of plastic not being a biodegradable material, it breaks up into very small pieces due to UV rays, that are called “mermaid tears”. These pieces of “tears” are so small in size that cleaning them up is nearly impossible without other negative side effects such as bycatch of marine organisms. Fish and other marine life often mistake various sizes of this plastic for food which either ends up killing them, or makes its way into our own stomachs through the process of bioaccumulation as these plastics work their way up the food chain, posing serious threats to human health. This problem is occurring all over the world, even in our own backyard here in Hawaii. However, where does all of this plastic come from? There are many different ways for trash and plastic to enter the ocean such as, rivers, drains, and as a result of human acts of littering (either accidentally or intentionally). ​Plastic-filled debris can often be seen floating down the canal. While DLNR does have a catchment boom before the harbor, it is infrequently emptied and the changing tides often cause trapped trash and other debris to wash out this entrapment, back up the canal, then finally out to sea and nearby beaches after it passes on the side of the canal that lacks a secondary boom. In order to prevent plastic polluted trash from ending up in the ocean, the ideal solution is through educating the public, both adults and children. In doing so, these individuals would hopefully realize the full extent of their actions that they may not have fully understood previously, resulting in less plastics and other debris entering various streams and ending up at marine sources. A good start has been made recently by the SurfRider Foundation with their new “Ocean-Friendly Restaurants” campaign. Accredited food establishments do not use plastic plates and utensils that end up in the trash stream, especially for take-out foods. Waikiki is one of Hawaii’s most sacred gems that is adored by tourists and local residents alike. The existence of plastic and other pollutants along our shores and other aquatic systems is a direct threat to its environmental and economic prosperity. If this threat is to be adverted, vital resources such as the Ala Wai canal must be restored to its former glory by removing plastic pollution sources one cleanup at a time. 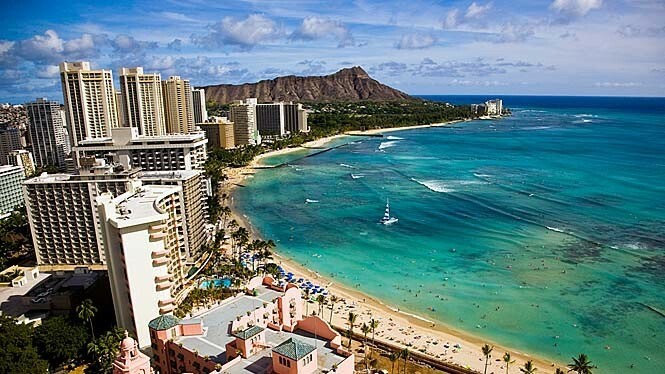 ​Why is Waikiki so beautiful? ​There are many City employees who work tirelessly to maintain Waikiki and its adjacent parks in such excellent condition. We can especially thank the many landscapers, arborists and maintenance folks who work so hard for the City’s Parks & Recreation Department. They obviously love our trees and park spaces for us to enjoy. To learn more about their work see the web page. Because Fort DeRussy is an Army reserve, it is flawlessly maintained by the landscape teams of the Hale Koa army hotel complex. Despite being a military zone, this extensive park has no perimeter fence and is open to the public during its daytime 5am-10pm hours. It has the best collection of tropical trees and palms anywhere. We salute the Fort DeRussy park maintenance staff. The hotel and business funded Waikiki Business Improvement District has a hugely successful Streetscape Maintenance Program “Malama Waikiki” that cleans and maintains the sidewalks and plantings along the Kalakaua & Kuhio Avenues from the canal bridge to Kapahulu St. and the streets in between. You’ll see their crews at work every day and will want to thank them. The business funded Waikiki Improvement Association also plays a key role in helping to keep Waikiki beautiful. They also hold quarterly beach cleanups. There are many other people who work hard to keep Waikiki beautiful. They consist of the hotels and condo associations who keep their streets and landscaped areas so beautiful for everyone else. Waikiki is arguably the most beautiful destination in the world. It is also the economic engine of the State of Hawai‘i and the center of its thriving international tourism industry. Each day about 150,000 people are in Waikiki to work, play and live and roughly 40,000 residents call it home. Among the many reasons it is such an acclaimed paradise are its stunning heritage of trees and its freedom from the visual blight of billboards and most other forms of outdoor advertising. ​Yet most people today are unaware that the foundation of much of Waikiki’s successful beauty lies in pioneering work by The Outdoor Circle (“TOC”) started nearly one hundred years ago. Many of the majestic heritage trees were planted or planned by TOC and the statewide outdoor advertising control laws were the result of more than a decade of diligent TOC campaigning. But this success can no longer be taken for granted as relentless commercial and political pressures continually challenge our unique environment with huge building developments and new forms of outdoor advertising. As a result, The Outdoor Circle recently approved the charter of our new Greater Waikiki Branch to raise awareness of the organization’s historic role in keeping the city and its parks “Clean, Green and Beautiful”. As the first urban branch of TOC we are aware that it needs to be quite different - with fresh ideas for its young mission, membership and methods. Our district includes Waikiki, from the encircling Ala Wai Canal to the beaches, and both Kapiolani and Ala Moana Parks. Our first priority is to complete the development of an entirely new online GIS mapping system that will allow users to view multiple maps of our trees, walks and historic structures - all right from their smartphones as well as home computers or laptops. Tree-loving watchdogs will also have information on what to do if you see a tree under threat. We will in addition provide the ability to check on your phone if a suspect advertising sign is legal and what to do if it not. We have recently begun working with a coalition of state, city, county and community organization partners to bring to fruition the “Lei of Parks” greenways from Diamond Head to Downtown. There is renewed focus on Livability as an essential quality of our life in Waikiki. Stay tuned for news of our forthcoming launch events. Please contact us if you would like to help by emailing: waikiki@outdoorcircle.org.